Jim Strawn is turning 21,000 days old on April 5th. To help him celebrate this milestone, the Fix’Em Clinic is having a birthday fundraising party from 6-8:00 p.m. that day at the clinic. Jim is turning 21K, but the Fix’Em Clinic is the beneficiary. 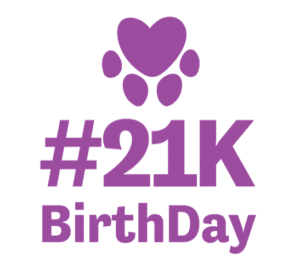 Simply go to www.21KBirthDay.com and click on the Donate button and contribute $10 or more the Fix’Em Clinic. The goal of the Fix’Em Clinic is to minimize the euthanasia and suffering of thousands of animals in our region and strive for a time when every companion animal has a loving home. A humane, sustainable solution is to prevent the births of unwanted litters through spay/neuter. To substantially impact the animal population, you must spay and neuter a LOT of dogs and cats and people must be able to afford your fees. They will accomplish this at the Fix’Em Clinic by spaying and neutering around 7,000 dogs and cats every year at a cost substantially lower than the average fee in our 23-county area. This clinic model is called a High-Quality, High-Volume, Affordable Spay/Neuter clinic. You can also bring your $10 (or more) to the Clinic on April 5th from 6:00-8:00 p.m. They are also accepting clinic ‘wish list’ items in lieu of cash donations. We are having cake and punch in Jim’s honor. And of course, lots of pictures. And please bring your furry little buddies along. Encouraging companies to purchase ‘wish list’ items and donate to the clinic. Address for the clinic is 102 Dee Drive Charleston, WV 25311.